A slightly different starting photo and slightly different processing. I’m enjoying playing with photos in this soft desaturated style and have discovered after many failures that choice of subject and background are very important and likewise light, soft indirect light seems to give the best results. I duplicated the background to start with. Using a Hue Saturation layer I reduced the saturation a touch. Gosgrain @ screen 54 % desaturated to taste. I started off having this layer toned blue to give the finished image a slight blue hue but changed my mind at the last moment and opted for just slightly desaturating the green of the texture. 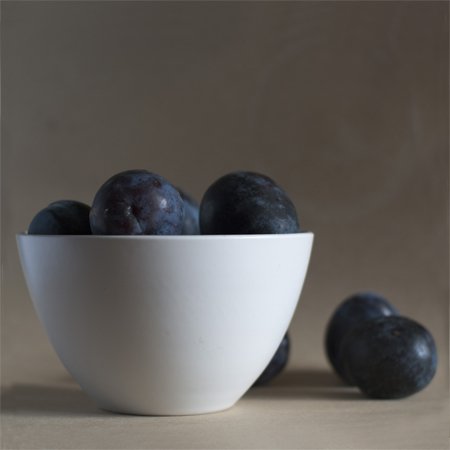 A touch of texture was removed from the focus fruit. The above processing is very similar to what I used on my recent stone and bowl image on flickr. This entry was posted on Tuesday, March 9th, 2010 at 11:07 am. 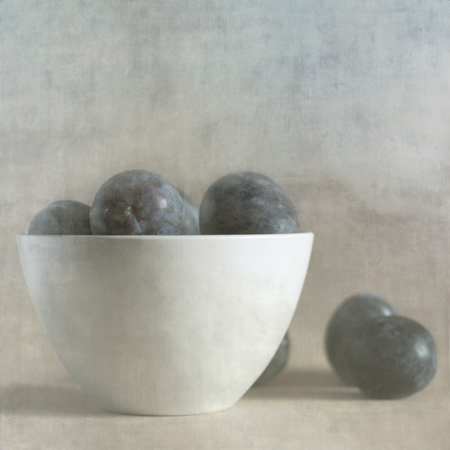 It is filed under Blog, Uncategorized and tagged with desaturated, fruit, Gosgrain, Jill Ferry, plums, Sail cloth, Still Life, Tex Box 1, Tex Box 2. You can follow any responses to this entry through the RSS 2.0 feed.